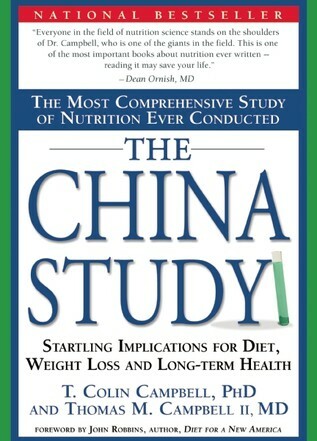 While this book has had its critics, and while I am not fully convinced by every single one of Campbell’s arguments, the scientific knowledge presented and the perspectives on diet, nutrition, and the interaction with agribusiness, science, and government make for a compelling and worthwhile read. Moreover, while criticism on specific points may be valid, Campbell is open and honest about the fact that some of the evidence is only suggestive, but his argument is that when all of it (the strong, weak, and in between evidence) is brought together the clear conclusion is that a whole-foods, plant-based diet is the way to be healthy physically and mentally throughout life. This is a somewhat more strict and specific formulation of Michael Pollan’s “Eat food. Not too much. 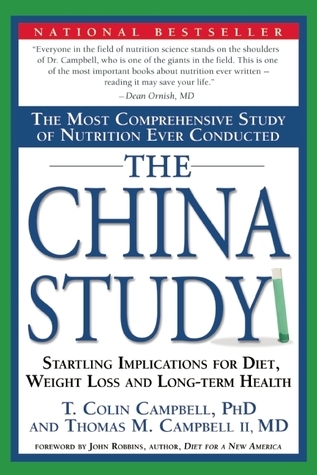 Mostly plants.” One major difference though is that Campbell suggests that you can actually eat plenty as long as it is healthy, as studies have shown that vegetarians generally consume more calories but are healthier (with regards to a host of particular diseases discussed in the book). I am not fully convinced that the data suggests avoiding meat and animal products completely, though I do avoid such products myself unless they are sustainably grown/raised. The protein and cancer relationship is an interesting and convincing one that I’d like to see continued research on, however little solid evidence is presented showing that animal protein is worse than plant protein. After detailing studies that show animal protein (particularly casein in several studies) is a major cancer enhancer above certain levels, he claims that other animal proteins show this effect and more so than plant proteins. I would have liked to seen the details of that. He points to one of a group of graphs showing correlations between animal protein consumption, vegetable protein consumption, and breast cancer (if I recall correctly), and claims that the graphs suggest high animal protein/cancer correlation but little or no vegetable protein/cancer correlation. This was where I was outright disappointed, since the range of animal protein consumption was far greater than the range of vegetable protein consumption, and moreover the total protein/cancer correlation appeared considerably higher than the animal-only protein/cancer correlation. While there may be interactions of specific protein with our body chemistry, Occam’s razor would suggest we go with the simpler explanation, that an excess of protein (of whatever type; excess meaning more than the body needs) signals the body to do things that make it more at susceptible to cancer formation. Others more familiar with the field may be able to provide greater clarity on the point. The evidence presented with regards to diet and a host of diseases from diabetes to heart disease, dementia, and even autoimmune diseases seems strong. Of course detailed evidence of precise causes is in many cases not available or is confusing, but that only strengthens Campbell’s argument as to how we should be eating and how we should be focusing research efforts. His denouncement of reductionism I think goes too far, but in the broad strokes I think his arguments have merit. What I think doesn’t go too far, but is right on, is the idea that people should be given recommendations based on what is right, not based on what we think they may or may not be willing to do. In other words, Campbell suggests that doctors and health officials shouldn’t shy away from recommending a diet with, for instance, no more than 12% protein, just because people might ignore that information completely. People deserve the truth, and then if we want to help them reach toward the best diet we can get them on the path with the knowledge that every step toward the goal is, according to the evidence, effective in improving health. Finally, Campbell’s discussion on the relationships between agribusiness, scientific panels and reports, and government round out the book to provide perspective on how the debate over diet and health have been shaped over the last century or so. Fortunately this section did not stray too far from the point of the book, as it might have gotten deep into politics. However it provided enough of a narrative from Campbell’s direct experience, to give the reader a good sense of what’s going on behind the scenes that affects policy and dissemination of health information to the public. In the end, for whatever flaws there are in the book, Campbell makes a strong case backed by substantial evidence and reason for at least substantially, if not completely, reducing animal-based foods and consuming whole-foods is the way to a healthy and long life. Moreover, it gives the reader the knowledge and critical reasoning skills necessary to put future media reports on diet and health into proper perspective so that we don’t have to always be so confused by the apparently contradictory evidence.